Working in the areas of quality and metrology for over 20 years, the CT2M organizes interlaboratory comparisons (ILC) in various fields. Take part in the estimate of the uncertainties of measurement. This proficiency testing is intented for all European laboratories that are accredited or not accredited for the tests according to EN 1656 and EN 13697. 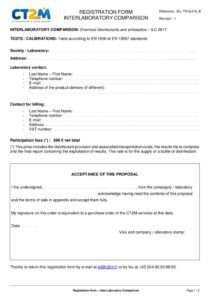 EN 1275 April 2006 – Quantitative suspension test for the evaluation of fungicidal activity and yeasticidal basic chemical disinfectants and antiseptics – Test method and requirement (phase 1). EN 1276 March 2010 – Chemical disinfectants and antiseptics – Quantitative suspension test for the evaluation of bactericidal activity of chemical disinfectants and antiseptics used in food, industrial, domestic and institutional areas – Test method and requirements (phase 2, step 1). 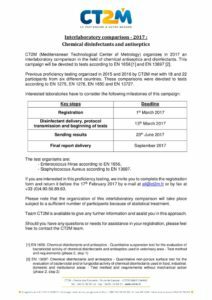 If you wish to solicit the CT2M for achieving an ILC, please contact us at : eil@ct2m.fr.